Ethos: noun – The aggregate of features, qualities, values, beliefs, attitudes, and traits that form the individual nature of some person, society or thing. Ethos Leaders demonstrate leadership through their beliefs, attitudes, values, and business philosophies. Being an Ethos Leader is about consistently setting the tone from all perspectives, including professionalism, morality, integrity, ethics, and competitive approach. People choose to follow the Ethos Leader because of what they stand for, or the perception of what they are made of. Thus, Ethos Leadership tends to deal with issues of personal and organizational substance. Therefore it is not surprising that the very first leadership quality we uncovered is one that many experts consider to be the foundational requirement for any form of sustainable long-term leadership and trust. Research shows that many people have reported that they will follow a person, company or cause based on the depth and quality of the values, beliefs, or attitudes of the leader associated with that company or cause. In total, all of these qualities become personal ethos, which is what we consider to be the initial building block of a leader’s personal brand. A person’s ethos is an incredibly powerful decision control mechanism that guides them as they make decisions about the actions (or non-actions) they will take. People and companies with a reputation for having a strong sense of character tend to win favor with others; as a result, they are more likely to be capable of influencing them to follow a course of action, plan, or initiative. The critical elements connected with personal character can vary from situation to situation, culture to culture, and person to person. However, one thing seems to be true: the stronger the positive characteristics of the person, the more likely they are to have a loyal and enthusiastic following. While most people indicate that they need to believe in the company or cause, they also suggest they need to believe in the belief system of the person leading the company or cause. In many cases, a person’s ethos will be developed over an extended period of time and is highlighted by many small examples of their character traits. While in some situations, a person’s ethos is developed and accelerated by their participation in a major event (e.g., someone who is thrust into a public situation or who performs heroically). It is important for those who seek to develop a personal brand based on a strong sense of character to clearly communicate their beliefs whenever possible. It is also important to recognize that, as the old adage says, actions really do speak louder than words. The decisions people make are a great barometer for an individual’s ethos, so they must seek opportunities to make the right decisions and avoid taking the easy road. Ethos leadership can be tough! 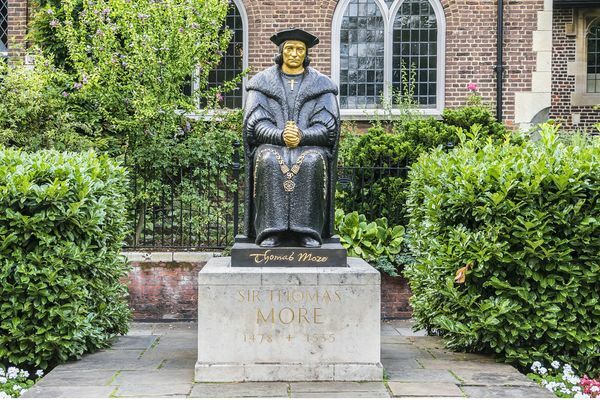 More, Sir Thomas (Saint Thomas More), 1478-1535. More was an English statesman and author of Utopia, celebrated as a martyr in the Roman Catholic Church. He received a Latin education in the household of Cardinal Morton and at Oxford. Through his contact with the new learning and his friendships with Colet, Lyly and Erasmus, More became an ardent humanist. As a successful London lawyer, he attracted the attention of Henry VIII, served him on diplomatic missions, entered the king's service in 1518, and was knighted in 1521. More held important government offices and, despite his disapproval of Henry’s divorce from Katharine of Aragon, he was made lord-chancellor at the fall of Wolsey (1529). He resigned in 1532 because of ill health and probably because of increasing disagreement with Henry's policies. Because of his refusal to subscribe to the Act of Supremacy, which impugned the pope's authority and made Henry the head of the English Church, he was imprisoned (1534) in the Tower and finally beheaded on a charge of treason. Philosophy: A personal brand is something that is built through words and actions. The Ethos Leader must always be conscious of how what they say and what they do continues to develop their personal brand as a leader and as a person with strong character traits. Mistakes to Avoid: Seeing ethos only as something that is about doing things. Sometimes it is the thing we choose to not do that defines our ethos and develops our personal brand as a leader. Be sure to recognize that every decision to either act or not act will become part of your personal leadership brand. Best Practices: Invest time thinking through your personal character qualities focusing on strengths as well as deficiencies. Create your own personal-ethos statement and be sure to find opportunities to voice and act on what you believe in. If you have character but people do not hear it or see it in action, you will have a challenging time creating a following. Leadership requires that other people have confidence in you and that means they must know about your beliefs and track record. What are the things I stand for? What are my beliefs and values? What is my general philosophy? How does that impact the way I perform? What do I want my personal brand to be, and how do I get it there? How well do I communicate my values, attitudes, and beliefs to my team? How well do I act on my values, attitudes, and beliefs? How do others read me from an ethos standpoint, and how do I improve? Who are the people I admire most and why? What can I learn from them? What do I want people to say about me when I am not around or in the press? What is the one thing I can do to improve my personal character brand?